Posted April 3rd, 2015 at 11:02 am. 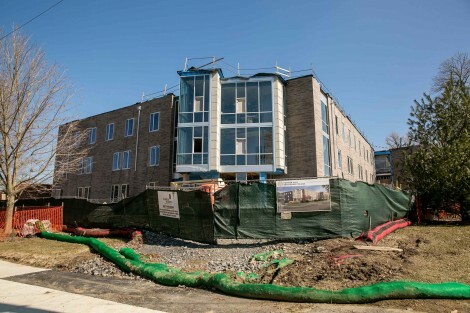 When we last posted an update on the new residence hall being built on the corner of N. Merion Ave. and Yarrow Street, Haffner Hall had just been taken down and the wood framing for the new structure was just being erected. Now, the new building is completely enclosed, including the roof. The brick siding facing Merion and Yarrow is finished, and the tri-tone fiber cement panels on the courtyard side of the dorm are nearly complete. Windows are installed and the glass has been installed on the atrium at the Yarrow-Merion corner. The elevator is being installed this week and interior room walls are completed. Work still remaining includes interior finishes (ceilings and floors) along with all the exterior work in the courtyard and the path leading to the main entrance. Fixtures in bathrooms, tea pantries, laundry rooms, and the Perry kitchen are yet to be installed. The project remains on budget and on schedule for fall semester occupancy of students. “We are excited to see the vision come to life and look forward to the point in construction when we can show it off to the entire campus community,” says Facilities Director Glenn Smith. Look for more photos as major construction ends and access to the interior of the building becomes possible. Philadelphia-based Atkin Olshin Schade Architects worked with the College on the building design. Hunter Roberts Construction Group is the principal construction contractor. The additional space will make it possible for the College to bring back to campus the students it currently pays to house off campus and to incorporate Perry House programming into the new space.